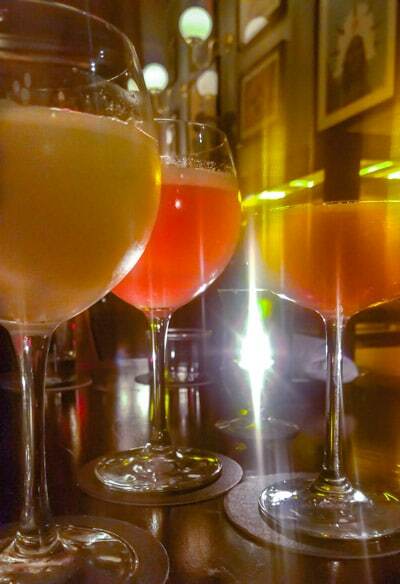 It’s just hard to beat New York City when it comes to excellent craft cocktail bars. It’s not that every bar is outstanding, but the fact that there are a couple of dozen truly world class cocktail bars in the City makes the tide rise for all the bars. So, more than passable drinks can be found almost anywhere. Still, why go for passable when a quick Uber, taxi or subway ride can take you to an establishment that serves unique and delicious cocktails? A couple of weeks ago, we hit a bar that we’ve been planning to get to for a while, Dutch Kills in Long Island City, Queens, and a new entrant on the scene, Blacktail in Lower Manhattan. Not surprisingly, both were great. If you’re downtown in Manhattan, as we were, Dutch Kills is a little bit of a trek. There’s plenty of transportation in NYC, though and we got there plenty fast. In fact, we got a little lucky arriving there a little after 5 and grabbing the last table in the small, dark place. The bar is a little hard to find since it’s all but unmarked. There is a small neon “Bar” sign, but other than that, you could walk right by it and not know it was there. We did just that. Once you get inside and let your eyes adjust – it’s pretty dark – it has a speakeasy feel. The bar is in the back and you walk by the tables on your way to it. The menu is basic – just a short, typewritten sheet, with their seasonal drinks and their classics. Of course, they’ll make anything you like. I had a Second Marriage. A great mix of Bourbon, Calvados (apple brandy) and Pedro Ximenez Sherry. If you’re a long-time reader of this blog, you know we use Pedro Ximenez as a sweetener in some of our drinks. You need to be gentle with it though. It doesn’t take much to have your drink taste more like sherry than your primary liquor. The Second Marriage had no such problems. Just a hint of the sherry taste sweetening the Bourbon and Calvados. It was excellent. We then got in an Uber and made the long trek down to Battery Park at the base of Manhattan. Well, it was long because of typical NYC traffic, but it wasn’t too bad. Blacktail is in an old Pier building in Battery park. The bar was created by the same people that did Dead Rabbit, another incredible bar in the City. Blacktail has the same great service, knowledgeable wait staff, and incredibly helpful doorman as Dead Rabbit. Combine those with the great drinks they serve, and people line up in the cold and rain to get in, which happens all the time. It’s worth it, especially since the doorman will work to get you in or tell you realistically how long you’ll have to wait. Blacktail is a Cuban-Themed cocktail bar. Well, that is, the theme of Cuba as it was in the middle of last century. As we wrote about before, the current Cuba cocktail scene is really weak. The bar is decorated like old Havana and the drinks are definitely tropical in nature – plenty of rum and juice. 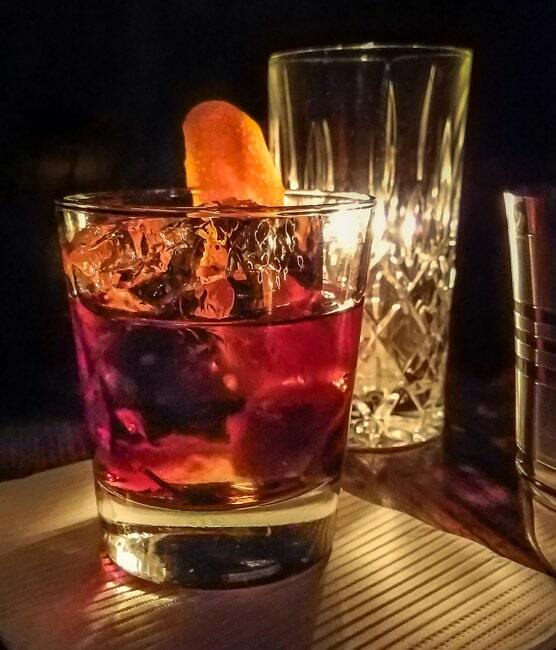 That said, their menu is broken into sections labeled, Highballs, Punches, Sours, Old-Fashioneds and Cocktails and each section contains Cuban-inspired drinks, the classics and some exclusive drinks created by the bartenders there. If Carribbean-style drinks are not your thing, there are plenty of other choices including, of course, making up your own for the excellent bartenders there to mix for you. I had a Mary Pickford, a classic done with the bar’s Cuban flair. It’s made with a few different Cuban Rums, Cherry, Pomegranate, Lime, Pineapple, Burlesque Bitters. Drier than it sounds, it was quite good. I finished the night with a Sazerac, my go-to drink to test out a bar. Unfortunately, it wasn’t very good. Perhaps they ran out of Absinthe? It didn’t taste like they used any. I’m partial to ours. Trust me, you won’t mistake the fact that Absinthe is an ingredient in our recipe. Both bars are highly recommended as are the other NYC bars in our map below. Remember to check out our growing list of favorite cocktail bars here when you travel to a new place. And please, drop us a note when you come across a killer bar that we should check out.